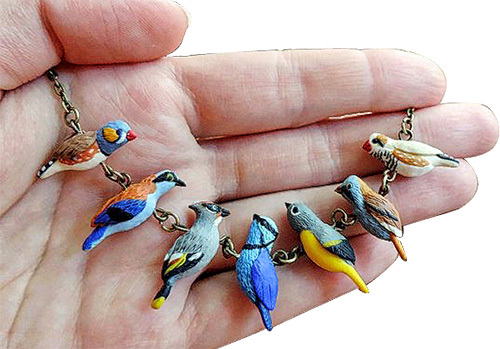 Ukraine’s Darya Podorozhna (sofoxyclay) gathers a flock of polymer birds on a delicate chain for bird lovers to wear and admire. 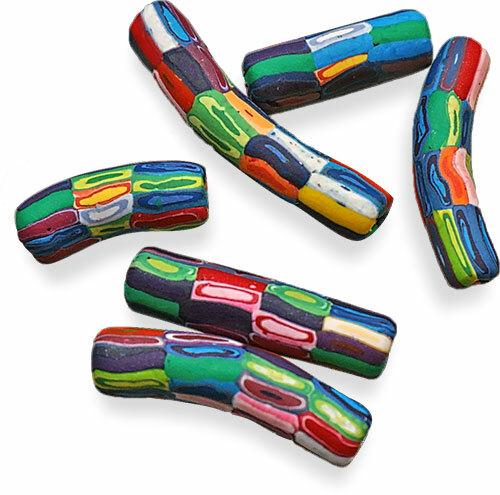 While these little beads don’t require much clay, they do demand a keen eye and attention to detail. Birders know their birds. You can catch them on Etsy and here she is on Instagram. The first week after vacation has rushed by and already I could be back in the holiday frenzy. Over at StudioMojo, we’ll try to slow it down and move into the holidays with grace, a smile, and gifts from our hearts. Join us. 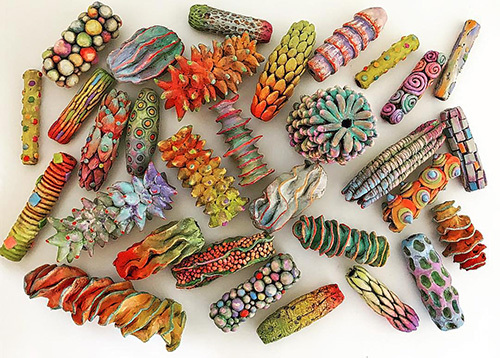 The way Germany’s Eliska Koliosova (fimeli) experiments with tube beads and plays with extruded patterns makes me want to know more about her and her work. She’s quite elusive on her Flickr pages that contain mostly dreamy photographs with polymer experiments sprinkled in. Look at how she plays with shapes and scrappy bits in this necklace. My interest in finding meaning in beads made from scraps has taken me to strange and interesting areas. I’ll be taking the month of November off to explore this phenomenon and write about it. No PCD for a month! Writing daily is such a habit that taking a break scares me. This week and then some time off. It will be good for our relationship, right? Chicago’s Marina Rios (FancifulDevices) creates rustic, Victorian, tribal style mixed media assemblages. Her antique and vintage materials are heavily altered and combined with artisan components to create evocative objects. Marina adds sand, ground and dyed oyster shell, embossing powders, pre-baked and chopped polymer and more as inclusions in the beads that stack up into this Regolith totem. 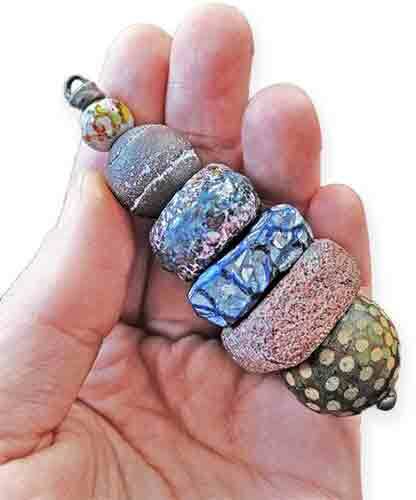 After firing, she begins painting – back-painting, resist, dry brushing, glazing and more to give this 3.4″ stack of beads its history and mystery. If you like it when cosmic collides with tribal in polymer, check her out on Instagram and Etsy. 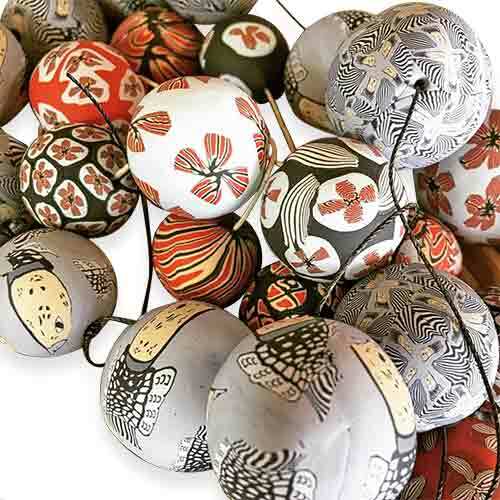 These beads from California’s Leslie Aja ease us back to fall. Leslie was inspired by early beads created by Cynthia Toops. 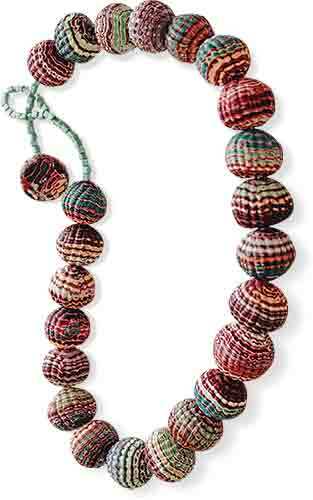 On Leslie’s Instagram, she features several groupings of simple beads in striking colors. Their simplicity and strong colors strike just the right note as the season begins to change. Need more? Come on over to StudioMojo this weekend where we’ll finish our wrapup of fall events and look at what products and ideas are on the horizon. Since my network is taunting me with an intermittent signal, we’ll lean on New York’s Doreen Gay Kassel for a post that requires few words and a quick upload. Just look at those beads! The colors and textures beg us to fondle them. You can look more closely on Instagram. Wifi repairman has been called! I had to walk over to my studio to post. They have a fiber connection that has spoiled me.